Genealogy.ie regularly has articles published in genealogy and local history magazines, both in North America and Ireland. Our articles are on how to do research, Irish local history, genealogical resources, etc. On this page you can read about the periodicals we have been published in and download our articles. 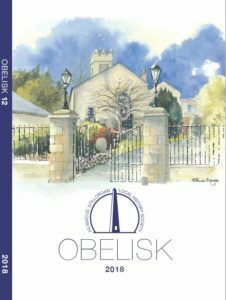 The thirteenth edition of the Kilmacud Stillorgan Historical Society’s annual journal, Obelisk, was launched in the Function Room of Glenalbyn Sports Club, Stillorgan on Thursday, 22 November 2019 to an audience of over 100. Margaret Smith paid a special thanks again to the many contributors for their very enthusiastic response with material and whose stories help to give us a fuller picture of daily life and the streetscape of times past. As in previous years, Michael van Turnhout, fellow director of Genealogy.ie was one of them. This year our article is about a local school. It is not a particular special school. Hundreds like it have existed and many of them still exist. And some of them are still schools, as is the case with this one. What is a little bit special about it, is that its history gives you a good picture of the school that your Irish ancestors might have gone to in the middle of the 19th Century. You can download a text only copy of the article by clicking on the link above. Clicking on the picture below will bring you to the Society’s website. 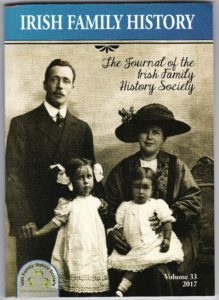 The Irish Family History Society, established in 1984, is based in Ireland and has a worldwide membership. Every year the Society brings out a journal, full of informative articles. This year, in Volume 33, our own Jillian van Turnhout was asked to contribute an article. The title of the article – which has pride of place as the very first article – is “John Fenton Hudson, 1932 Captain Royal Dublin Golf Club, The ‘Missing Photo’ Challenge”. In it, Jillian outlines the research she did on behalf of the Golf club to find a photograph of this previous Captain. All past Captains were remembered with a photo in a gallery at the club. However, John Fenton Hudson’s was missing. As he had been a life long bachelor, so there were no descendants to ask. After extensive investigations, Jillian was successful in finding a picture, which is now proudly hanging in the Captain’s gallery. Clicking on the picture will bring you to the Society’s website. 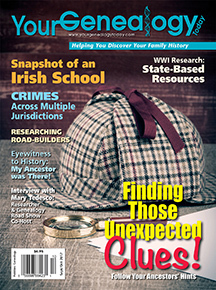 Our second article in this North American genealogical magazine (see below for our first). 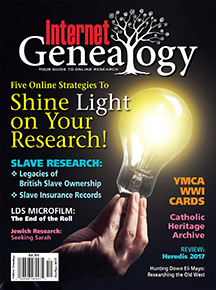 Clicking on the cover picture will bring you to their website; our article is “Avoid Common Mistakes” about preventing research errors by using the guidelines of the Genealogical Proof Standard. 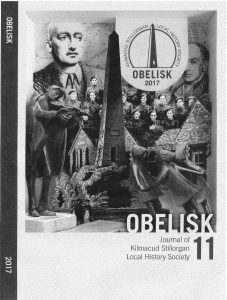 Irish Local History Magazine. Published November 2017. Clicking on the cover picture will bring you to the website of the Society that publishes it. Our article is “Gordonville”, about the history of a house and the village it is in. The downloadable article is text only, the article in the magazine also includes pictures and maps. 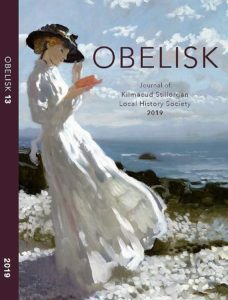 A leading North American genealogical magazine that focuses on keeping today’s family historian up-to-date with the vast and ever-growing collection of genealogy-related resources, software, tools, products, technologies, etc. Clicking on the cover picture will bring you to their website; our article is “Legacies of British Slave Ownership” about a very unusual genealogical resource that contains a wealth of information on those who owned slave plantations in the Caribbean. 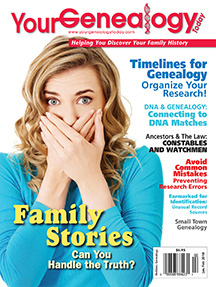 Another North American genealogical magazine full of research tips and genealogy news. Clicking on the cover picture will bring you to their website; our article is “Snapshot of an Irish School” which gives an example of what you could learn about your ancestor’s school and how you go about getting this information for the local school they went to. 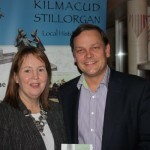 Irish Local History Magazine. Clicking on the cover picture will bring you to the website of the Society that publishes it. Our article is “Moreen: From the Pale to Markievicz to the Central Bank” about the history of a house and some of the famous people associated with it. Not only did we contribute to this publication, it was also launched by our own Jillian van Turnhout. Clicking on the picture – which was taken at the launch – will bring you to a page with all photos of the launch. Our article is “Woodside, Sandyford” about the history of a beautiful farm house and its occupants.